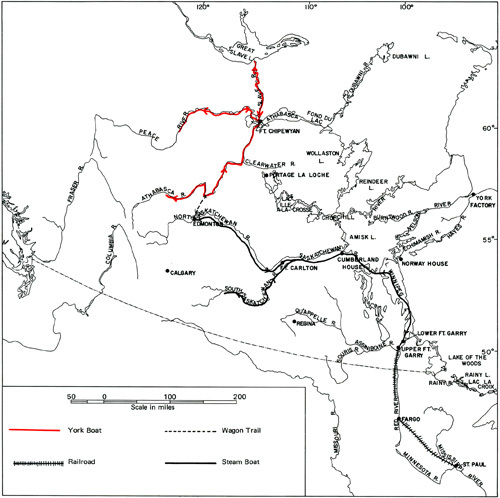 The reader will remember that by 1875, the traditional trunk route from York Factory to Norway House had been superceded by the St. Paul trail, and that this greatly enhanced the position of Lower Fort Garry in the freighting system of the Hudson's Bay Company. 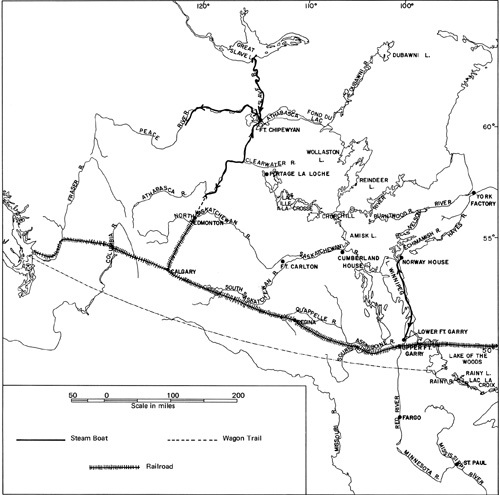 A second transportation revolution beginning in 1877 and completed by 1893 changed both the routes and technology of transport in the Northwest. This period of startling transformation was the railway age, and its advent brought the steady decline and obsolescence of Lower Fort Garry. The technological demands of the paddle-wheeler gave way to those of the locomotive; and, once it was decided that the transcontinental line would pass through Winnipeg rather than Selkirk, it was clear that primacy in the fur trade belonged to the old seat of the Company at the forks. Confederation, the railroad and immigration combined to change the character of the West and the conditions of the Hudson's Bay Company's trade. The development of a stable agricultural economy relieved the Company of the old problem of provisioning. Except in the northernmost regions, merchandise was shipped in freight cars owned and operated by the Canadian Pacific Railway instead of river steamers maintained by the Company. The speed and certainty of communications made it unnecessary to keep large inventories of goods on hand. In the south, the merchandising methods required to serve a settled population rendered trading forts obsolete. Upper Fort Garry was sold and demolished in 1882. The warehouses, the sales shop, the farm and the shipbuilding yard of the lower fort had become a liability. In 1911 a "northern dog team driver cracked his whip and with a loud 'marche', swung his huskies proudly and for the last time round the crescent inside the fort to the sales shop. There, meeting a Company trader, he reenacted a scene which had taken place in the fort for 80 years and so trading ended at Lower Fort Garry. "12 Clerk John Stanger closed and locked the old Stone Fort. Conscious of the fort's historic character, the Company offered it to the governments of both Manitoba and Canada, but neither would at that time accept the responsibility of custodianship. Nonetheless, Lower Fort Garry was destined for the most gracious retirement ever accorded a trading post.